A big step in ocean wildlife management. Researchers have combined maps of marine predator habitats with satellite tracks of fishing fleets to identify regions where they overlap—a step toward more effective wildlife management on the high seas. To create the map, scientists analyzed the habitats that more than 800 sharks and tunas and 900 industrial fishing vessels occupy. Focusing on international waters in the northeast Pacific, they found that vessels from Taiwan, China, Japan, the United States, and Mexico accounted for more than 90 percent of fishing in key habitat areas for seven shark and tuna species. The researchers hope the findings will help the United Nations member states currently formulating the world’s first legally binding treaty to protect international waters, known as the high seas. “We may protect a species near the coastline of North America, but that same species may be exposed to a high level of international fishing in the open ocean. By increasing the transparency of where fish and ship fleets meet, we can identify hot spots where international protection may be required,” says Barbara Block, professor of marine sciences. 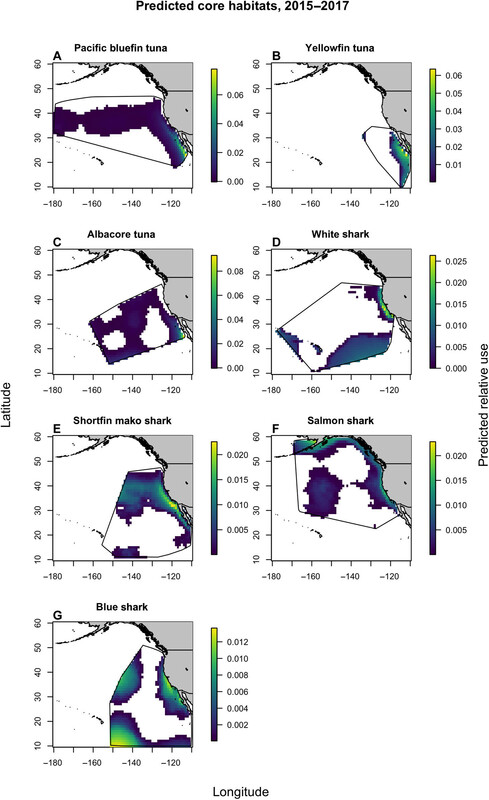 Core habitat predictions for seven species of pelagic sharks and tunas. The team’s work builds on a 2018 study in Science from Global Fishing Watch, the Block Lab, and other researchers, in which researchers took four years of data from the Automatic Identification System—which tracks vessel movements via satellite—and developed a machine learning algorithm that mapped the footprint of 70,000 individual fishing vessels across the globe, down to details about the fishing methods of each vessel. In the current paper, the researchers narrowed their focus to the activities of over 900 vessels from 12 countries in the northeast Pacific Ocean to better understand the degree of overlap among fishing fleets, sharks, and tunas in those waters. Two significant mysteries have hindered finding meaningful solutions to overfishing of some shark and tuna populations: where fishing happens and where fish hang out. In order to help solve these mysteries, researchers combined ship positions with the ocean habitat preferences obtained from the decade-long tracking program called Tagging of Pacific Predators (TOPP). The program includes Pacific bluefin tuna, yellowfin tuna, albacore tuna, white shark, shortfin mako shark, salmon shark, and blue shark. With the exception of the salmon shark, all of the species appear on a list as threatened or near-threatened on the International Union for Conservation of Nature’s Red List of Threatened Species, though people sustainably fish some populations in the northeast Pacific region. Over the 10 years of the TOPP program, researchers deployed 876 electronic tags on individual sharks and tunas. Hundreds of individual journeys—each spanning hundreds to thousands of kilometers—showed which areas of the ocean each species prefers. By integrating the animal, ship, and environmental data, the researchers predicted what ocean regions and commercial fishing fleets have the highest overlap. The United Nations’ high seas treaty discussions, going on through 2020, are very much on the minds of the researchers, who believe their work could help guide which parts of the northeast Pacific Ocean deserve special consideration, what kinds of fishing activities need addressing, and which nations have a major role to play in protecting these waters. Additional coauthors are from the National Oceanic and Atmospheric Administration, the University of California, Santa Cruz, the University of Delaware, and the University of the Sunshine Coast. The Bertarelli Foundation, the National Science Foundation, and the California Current Integrated Ecosystem Assessment Program funded the work.